Cellucor is a big player in the sports supplements industry and we’ve always loved their dedication to offering the most variety in workout supplements and supplement flavors. Take Cellucor’s C4 pre workout for example – there are several variations of this product plus countless flavors on top of that! We’re here to talk about BCAA and Amino Acid supplements though! So if you’re interested in stocking up on intra workout supplements from Cellucor; then you’re going to want to read what we have to say about Cellucor Beta BCAA and Alpha Amino. We’ve done our research and here are the facts that separate the differences between these two amino acid products and who they are designed for. Below we have summarized each of the amino acid supplements by Cellucor to the best of our knowledge. We hope that this helps you to make your decision when choosing your next amino acid supplement. 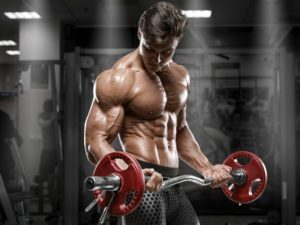 If you are still undecided, you can view our Best BCAA Supplements list for additional options on amino acids to add to your bodybuilding supplement stack. 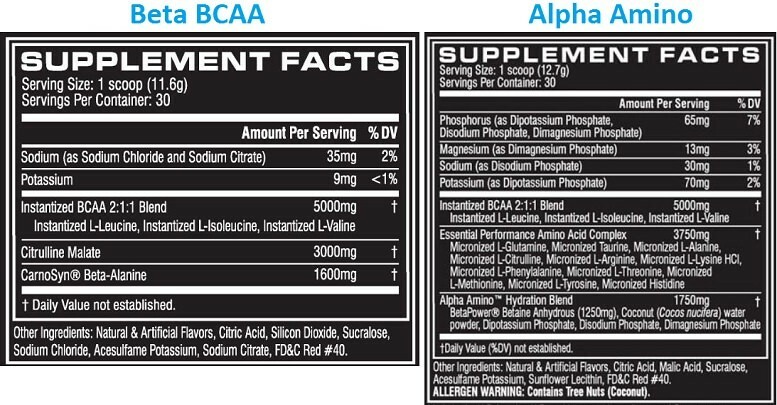 Here, you can see the direct ingredient differences between Cellucor’s Beta BCAA (left) and Alpha Amino (right). Both Beta BCAA and Alpha Amino contain 5,000 mg of BCAAs per serving. So, where does this leave us? 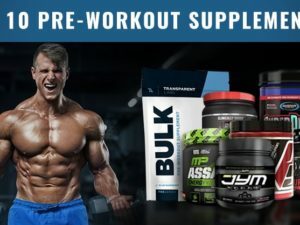 Which one of these Cellucor products is best for what purpose? Here are our breakdowns of each product, and how we believe it should be used in comparison to the other. Now, as you know – Beta BCAA contains BCAAs (5 g), Citrulline Malate (3 g), and Beta-Alanine (1.6 g). We mention double scooping, because 5 grams of BCAAs is on the low side. Plus, if you want to enjoy the real benefits of Citrulline Malate and Beta-Alanine, doubling up is required to hit the clinical dose. With that being said, depending on how you use Cellucor’s Beta-BCAA, consider the total serving count cut in half in order to meet your needs. Alpha Amino on the other hand hasn’t changed its formula as far as we know. With each serving of Alpha Amino, you’re getting: BCAA (5 g), EAAs (3.75 g), and a hydration blend (1.75 g) containing betaine, coconut powder, and some electrolytes. However, we really don’t think this product can fulfill a stim-free pre workouts role even at 2 servings. Overall, Cellucor makes some half decent BCAA supplements. Of the two, we lean more strongly towards Beta BCAA as a bodybuilders supplement. However, we are also interested in the possibility of combining Beta BCAA with Alpha Amino, to achieve 10 grams of BCAA with Citrulline Malate, Beta-Alanine, EAAs (essential amino acids), and hydration complex. Therefore, we have to default onto full support for Beta BCAA – specifically at 2 servings at a time. With that, you are getting 10 grams of BCAAs in the 2:1:1 ratio, 6 grams of Citrulline Malate which is backed by research, and 3.2 grams of carnosyn beta-alanine which is also backed by research. Have you tried either of these Cellucor BCAA products? Drop us a line below and let us know what you thought, as well as what you plan on using in the future to maximize your progress!